Make this Bacardi rum cake recipe a day or two ahead as the rum soaked cake will taste even better when the flavors have time to blend. 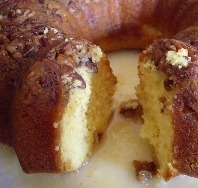 This delicious moist cake is an easy cake recipe as it uses a yellow cake mix and pudding mix. The rich buttery rum glaze that is absorbed throughout the cake makes this the best rum cake for any holiday or special occasion. 1. Preheat oven to 325 degrees F. Grease and flour a 10-inch Bundt or tube pan. 2. Sprinkle chopped pecan pieces on the bottom of the pan. 3. In a large bowl, combine cake mix, pudding mix, eggs, water, oil and rum. Beat with a mixer on low speed about 30 seconds to combine. Increase mixer speed to medium and beat for 2-3 minutes or beat by hand with a whisk until smooth and there are no lumps. Pour batter evenly over the nuts. 4. Bake the Bacardi rum cake for 50 minutes to 1 hour. Cake is done when a toothpick inserted into the center comes out clean. Remove from oven and place on a wire rack. When the pan is cool enough to handle, place the cake, bottom side up on wire rack. Prick the bottom of the cake with a toothpick or thin skewer. 5. While cake is cooling, make the rum glaze. In a medium sauce pan, melt the butter. Stir in water and sugar. Boil 5 minutes, stirring constantly, making sure all of the sugar is dissolved. Remove from heat. Carefully stir in rum (mixture will sputter). Let cool for a few minutes. 6. Spoon about one-third of the rum glaze on the bottom of the warm cake. Place the cake, top side up on a serving plate and prick the top with a toothpick or thin skewer. Spoon and brush the rum glaze over the top and sides, allowing cake to absorb the glaze. Continue until all the glaze has been used. Let cool completely.